Good morning and happy Tuesday! I know. Late to the party this week. Did you have a good one? 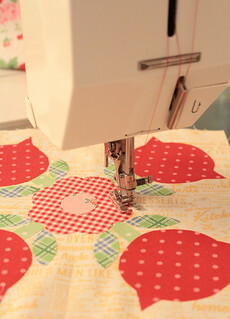 It was busy here at Casa de Kitty, Saturday I had a sew day and it was awesome! Debbie hosted and it was great as usual. Deb came up from San Luis Obispo and she brought a fantastic cake from the Madonna Inn. You can see a photo on Instagram here. We laughed and ate and sewed the day away. I think we all got something done, I got the center of the pieced blocks done, and yesterday I finished those up. I also even managed to get a couple of small projects bound. Sunday we went to the birthday party for the son of a long time friend of ours. Of course I can't believe our friend Shawn is old enough to have a child to begin with, Mason turned 3 ! It's been a long time since we hung out where there were kids, holy cow! All that energy! I'm now into blanket stitching on the Tulip Garden blocks and I love it. I will stitch all the reds, then the pink then the greens. I'm always curious how other people approach a project. Do you finish each block before moving on? Or do you have some other method? Oh I miss SLO and the Madonna Inn and sourdough bread. I lived in SLO many years ago. early 80's. Love your blocks. I need to try machine blanket stitching. MMM the Madonna Inn's cake looks delish!! As for blanket stitching I prefer to work on each block as it is finished, BUT if it's a small wall hanging my choice is to blanket stitch after the sandwiching as it gives added depth to the fused pieces. I was fortunate to take a class from Cathy Hoover that involved blanket stitching. How lovely to have sewing friends. The tulip block is really cute. I like the style of these tulips!